You may find this item, or something similar to it, on the pre-start checklist for just about any small or piston general aviation (GA) aircraft you fly. You are probably familiar with the passenger briefings you hear on airliners, and you know that the regulations'Title 14 of the Code of Federal Regulations (14 CFR) '91.107' require you to brief your passengers on how to fasten and unfasten seat belts and (if installed) safety harnesses. That's clearly important, but have you ever stopped to think about what else a truly "complete" passenger briefing in a GA aircraft should include? If not, you might start by taking a look at 14 CFR 91.519, which outlines the briefing requirements for large and turbine-powered multiengine airplanes and fractional ownership programs. While not everything on this list applies to a typical GA airplane, it still contains all the basic elements for a comprehensive and professional briefing. Arranged for easy recall, here are the items essential to a complete passenger SAFETY briefing. In addition to these required topics, it is a good idea to brief your passengers on how to adjust and lock the seat position. This discussion is especially important for the passenger in the right front seat. Just imagine how startling (not to mention dangerous) it would be for everyone aboard if an un-briefed and unsecured passenger reacted to sudden rearward seat travel by instinctively grabbing the yoke. You want your passengers to be comfortable during the flight, so the second major item to include in your briefing is environmental controls. Show your passengers where the air vents are located, and tell them how to open and close overhead and/or floor-level vents in their seating area. Many GA airplanes have other environmental controls (e.g., cabin heat) located somewhere on the instrument panel. If your passenger is airplane-savvy, you might show him or her how to adjust some or all of these controls. Remember, though, that for most non-pilots, the instrument panel for even the smallest GA aircraft is a bewildering array of dials and knobs and switches that all look alike. Unless your passenger has at least some experience in GA aircraft, it may be best to tell them to let you know if they are too hot or too cold, so that you can make the adjustment. The subject of air brings up a more delicate issue'airsickness. Opinions differ widely on whether, and how, to discuss this topic with passengers. Some pilots advocate a direct approach, including a full briefing on location and use of airsickness bags. Others believe that a specific briefing triggers the power of suggestion in potentially queasy passengers, and prefer to avoid the subject entirely. You are the judge of your passengers' tendencies toward motion sickness, but if you are in the "don't tell" group, you will still want passengers to know that they should tell you right away if they feel uncomfortable for any reason. Fires can, and do, occur in GA airplanes, especially with engine starts. You obviously don't want to scare your passengers, but the extra pair of hands could be very useful if you find yourself fighting flames during any part of the flight. If you have a fire extinguisher on board'you do, right? 'Show your passengers where it is located, how to unlatch it from its mount, and how to use it in the unlikely event of a fire. Passenger briefings on airliners always include information on the location and operation of doors, and yours must do no less. The location of the door'or doors, depending on the model'is no mystery on most GA airplanes, so your briefing can be limited to door operation. Make sure that your passengers know how to open the door(s) in the event of an emergency evacuation. Since no one needs the distraction and discomfort of a door opening in flight, it is also important to brief your passengers on properly securing the door(s). If your aircraft has doors on both sides of the fuselage, it is a good idea to develop and brief specific exit procedures to facilitate rapid evacuation of the aircraft. For example, you might plan on keeping your seat forward to allow rear seat passengers to exit via the left door, while you follow the right-seat passenger out the starboard door. This method allows you, as PIC and captain of your ship, to oversee the passenger evacuation before leaving the aircraft yourself. For aircraft with a single right-side door, consider what works best for a given group of passengers. You might want to have the right seat passenger exit and move the seat to allow rear seat passengers to follow, with you departing last. Alternatively, you might want to follow the right-seat passenger but remain at the door to assist in the evacuation of those in the rear seats. There is no single correct evacuation strategy, so the most important thing is to think it through in advance and communicate the plan to your passengers. 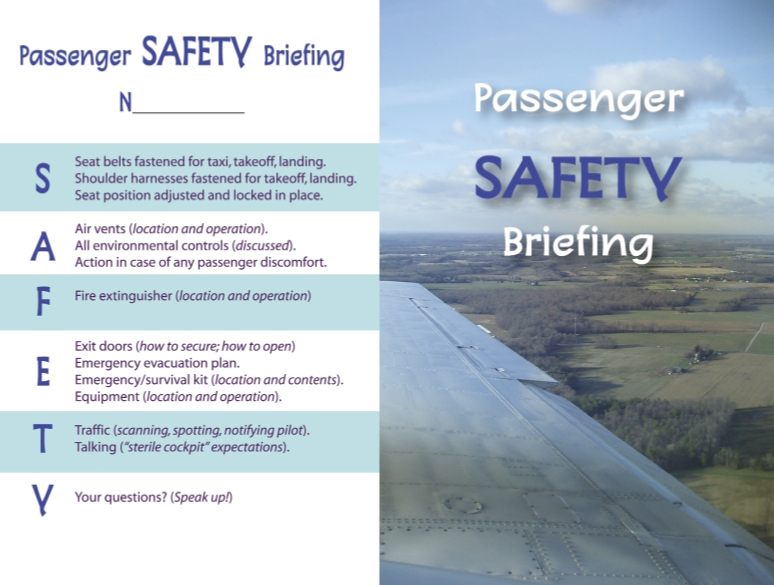 Another part of the emergency exit briefing is to designate a gathering point (e.g., walk aft to avoid the prop and gather at the rear of the aircraft). If you carry survival equipment, point it out to all passengers. Stress that safe and expeditious evacuation is the most important consideration, but consider designating one of your rear-seat passengers to be in charge of carrying survival equipment out of the aircraft if circumstances permit. Finally, be sure to explain any equipment, such as supplemental oxygen, that passengers are expected to use during the flight. Even if you are operating under instrument flight rules (IFR), you still have a responsibility to see and avoid other traffic any time you are in visual meteorological conditions (VMC). It never hurts to have extra eyes scanning for traffic, so brief your passengers to let you know whenever they spot other aircraft. In addition, tell them what you want them to tell you. A simple "airplane on the right" will suffice, but since everyone can visualize a clock, you might ask him or her to given you traffic information in terms of the "o'clock" positions used by ATC. The added advantage of this option is that passengers listening to ATC communications will have a better idea of where to look when you get a traffic call. Expectations for communications 'talking'are another good topic to include in your passenger briefing. Passengers may not readily understand the term "sterile cockpit," but they will certainly understand that there are times when you need to focus fully on your flying. Let your passengers know that they should not attempt to talk to you (except for traffic point-outs) during the busy takeoff/climb and approach/landing phases of the flight. If your intercom does not permit you to isolate the crew, let passengers know if you expect them to minimize their own conversation during these times. It is both professional and polite to conclude by giving your passengers an opportunity to ask questions about any part of the flight. Since some passengers may be intimidated by the novelty of GA flying or embarrassed to ask "dumb" questions, watch for any signs of confusion or concern. Make a special effort to invite those questions needed to clarify any part of the briefing they did not understand. The question time is a great opportunity to reassure a reluctant rider, or to encourage a potential future pilot's interest in aviation. Passenger SAFETY Briefing -COMPLETE. Let's go flying! Susan Parson is a special assistant in Flight Standards' General Aviation and Commercial Division.